A hundred years ago, the First World War had just finished and the world could start to think about planning for a better future. After so much loss, many hoped that the League of Nations (founded 1920, mentioned on the plaque in the lych gate) would help promote peace. Meanwhile, across the UK, those who had suffered were commemorated and remembered in various ways, including war memorials, memorial halls and parks. 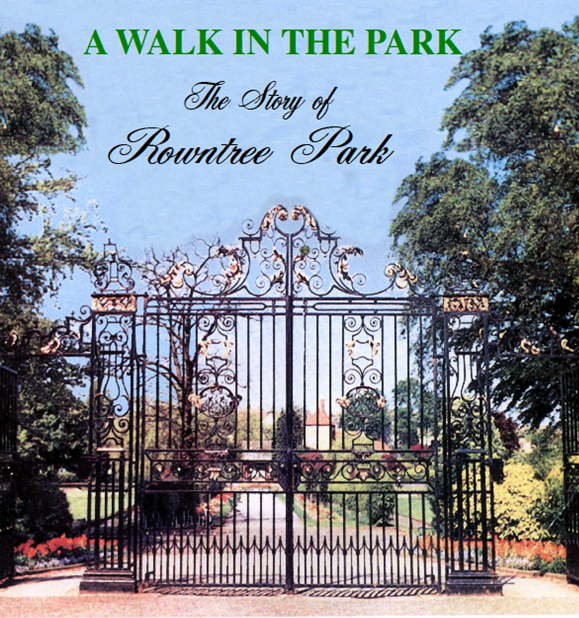 During 1919, Rowntree and Company Ltd bought several parcels of land which would eventually go together to make the area we now know as Rowntree Park. The park was to be a tribute to the Company’s workers who had suffered in the war. The largest section of land was Nun Ings, bought from the Ecclesiastical Commissioners for England (now known as the Church Commissioners), and this image from the conveyance of 31st December 1919 shows the fields that made up this area, bounded by Clementhorpe Beck, to the west and south. The drawing must have been based on a map done some time previously, as it doesn’t show Norfolk St, St Clements Grove and Aldreth Grove all of which were already laid-out and partially built by 1919; it does show some fish and a cute (but archaic) sailing ship! This blogpost is by Rose and June, Friends of Rowntree Park and local residents for many years. They remember the swimming pool in the park as being an important part of growing up in York. We welcome more contributions from people who remember the park – and from people who use the park now. Looking back, we realize we have different standards of health, safety and comfort nowadays. The play equipment stood on a concrete floor. What happened if you hurt yourself? We can’t recall but I doubt if the council was blamed. There was a terrace up a flight of steps which surrounded the pool. On a sunny day you could sunbathe in some discomfort as this surface was also concrete. The water was unheated and we can remember hovering at the edge of the pool knowing that the first few seconds would be a challenge. At the deep end were springboards. The steps up to the high one were wooden and could become slippery but we can’t recall protests about this – though people did sometimes hurt themselves. I (Rose) learnt to swim there as did many other York children. It was the one sport I was a success at and I represented our school, Mill Mount Grammar School For Girls (where we met each other in the first form), at the swimming gala. We agree that it would be good to have a swimming pool in Rowntree Park again, though this time with less slippery steps up to the diving board…. We knew that the wildlife pond was going into an area of the park that had been used as a dump. After about 20cm of top soil, we were into a layer of dumped domestic debris – bottles, jars, bits of twisted metal, part of a doll’s face, even a chunk of hymn book. Most of this is clearly of 20th century date, and we’re hoping that local people will be able to tell us their memories of some of the evocative-sounding brands. 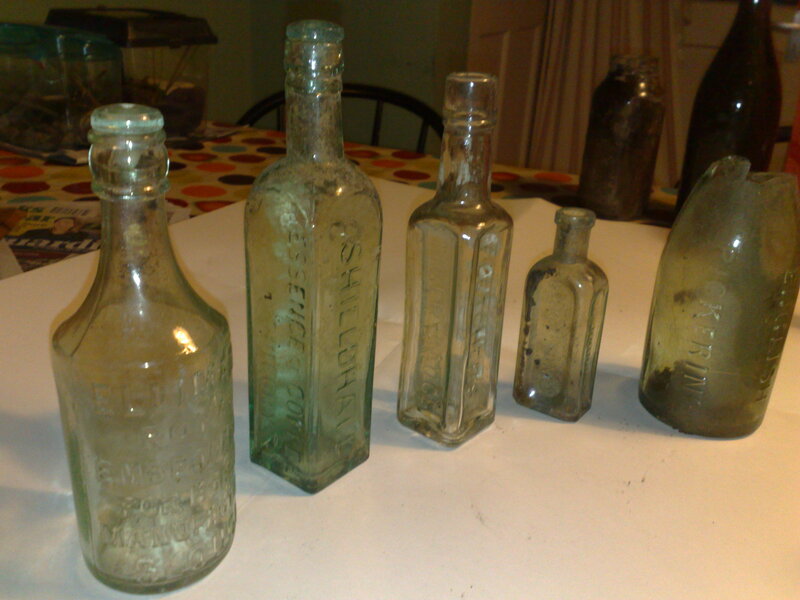 A lot of the debris were glass bottles and jars, many of which were at least complete enough to see what they had been used for. The brands discovered are from local firms from York, Selby and Hull, as well as more well-known firms such as Heinz. The first post to try out this blog is about our wonderful NEW BOOK!